One moment of silence for Eileen Moran, Executive Producer at Weta Digital and one of the producers on The Hobbit. She led Weta to many Oscars, including three consecutive ones for the Lord of the Rings series. To the occasional consternation of the artist, she was one to always say “Yes. Absolutely. We can do that.” And then, we did. She passed away after a long bout with cancer, just shy of the premiere of The Hobbit in Wellington. It’s been nearly a decade since we were last in Middle Earth. Peter Jackson provided for us a window into a world that we had previously only imagined. His vision of Middle Earth was everything I could have hoped for, and beyond. So when the announcement arrived that The Hobbit was going to production it became a roller coaster of anticipation and trepidation. Then Del Toro stepped aside due to a previous commitment (probably an upcoming movie with giant robots and monsters), and news came that Jackson would return to direct. Whew! Amen! Danger averted. But, he is going to make it in stereo…D’ohhhJeeesus. He can’t possibly be embracing this technology that rarely, if ever, contributes to heightening audience engagement in the story. More often than not, it’s done horribly and it contributes to headaches, nausea, and eye poking. There is hope though. Weta Digital, Jackson’s visual effects company, has a lot of experience with stereoscopic filmmaking, having worked with James Cameron for years to develop the technology to create Avatar. At least the 3D will be done properly – hopefully. God please. AND Jackson will be shooting at 48 frames per second. Double that of normal films, greater than the 29.97 fps of NTSC video, but less than the 60 frames per second adopted by many ride films. I know his intentions. I know his reasons. I’ve seen demonstrations and discussion with pioneers like Douglas Trumbull, Dennis Muren, and James Cameron – all promoting that higher frame rates create a more immersive experience. But every time I watched it, I remained unmoved. And faithless. And I wasn’t alone. The studios also had very little faith. According to Jackson, he had to bankroll all of the extra costs of the new technology himself. Twice as many frames (x2 more for stereo), at 5K (typically, films are 2K or even HD). That’s more animation, more rendering, more simulating, more bandwidth, and more storage. Furthermore, even IF the theory is sound, there is no quality control once the film is distributed. Negligent theater owners don’t want to maintain the bulbs in the projectors. Or, they don’t increase the foot-candle output of their 3D projectors to make the image bright enough to match how it was intended. This could be either because of parsimony or ignorance. Either way, its steals from the audience experience – and is utterly uncontrollable. Is the stereo RealD technology? Dolby? Active? Passive? Is the screen bigger or smaller than the stereo was designed for? This was such a recipe for filmic disaster. 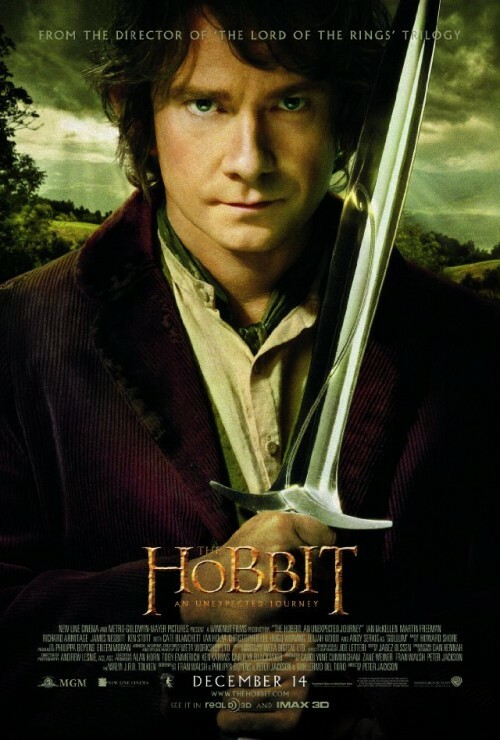 Finally, Jackson made the announcement that The Hobbit would stretch out from its original two films, to three. So many skeptical thoughts. Did Peter Jackson really think that their was so much more information in the Appendices that they could take the comparably slim children’s novel and expand it to the epic story that Lord of the Rings required? Did the studios support this move because it would generate another wave of a billion more simoleons than first projected? Or, as Weta artists alluded to, was there too much work to do and deadlines would not be met if they had to get half of the story done by its Christmas time release date? So much worry. What would happen to this story that I’ve loved since a child? So much pressure to match the success of the Lord of the Rings. Then came the opening weekend. Cinerama in downtown Seattle. It’s on the officially sanctioned 48fps international list of theaters. It uses RealD stereo. And they have chocolate covered popcorn. The opening Warner Brothers logo flies through and becomes the New Line Logo. Nothing too alarming. Then a horrifically realized MGM logo, starting with an extreme close-up of the lion’s eye. The reflection in the cornea breaking any reasonable 3D rules, and then resolving in a far from convincing new stereo logo. Howard Shore’s dulcet oboe leads into the theme of The Shire, as a familiar font reveals “The Hobbit”. My heart smiles. Maybe they did this right. The first shot. A close-up of a pen dipping in to an inkwell. Beautifully lit by Andrew Lesnie – the veteran cinematographer who lit Middle Earth before. More hope…. The next shot. Ian Holm as an aged Bilbo Baggins walks down a tunnel of Bag End… in a shot that looked like it was pulled from a 1979 episode of Dr. Who. I closed my eyes briefly. Took a deep breath. And, knowing that I was going to detest the look, prepared myself as I attempted to turn off the analytic eye of a visual effects supervisor, ignore the technicalities, and try to lose myself in the next three hours. I loved the story. I loved the telling of the story. The expansion of the tale allowed us to breathe and get to the know the characters – and there are a lot of them to know. We get deeper backgrounds for some of the key dwarves like Thorin and Balin. And we gain a deeper empathy for the plight of the dwarves and the loss of their homeland (is there an Israel metaphor possibly?). I liked the inclusion of the Orcs (not present in the novel), and an arch-enemy of Thorin in the form of a pale orc, Azog of Moria. This gave a common, continuous, and very real threat to our beloved party. Our new cast of actors was great; with special nod to Martin Freeman as young Bilbo, and Richard Armitage as Thorin Oakenshield. Jackson, or should I say casting director Victoria Burrows, has a distinct eye for actors who make good kings (ala Viggo Mortenson). Ian McKellan is always dependable and admirable. He’s a Knight for Gods-sake. I didn’t even mind the singing which I knew there was going to be a lot of. From a production standpoint, I admired the cinematography, but found some scenes to be overlit in places, and could have benefited with a little more chiaroscuro. Perhaps Lesnie is holding back on some of this until the story gets darker in later films. Sound design is top notch. Art direction is consistently good, and consistently within the established Middle-Earth. Even the makeup and costumes, I felt, held up, despite the Mexican soap-opera look of the whole film at 48fps. This is a feat, considering that the attention to detail had to be elevated due to the high frame rate technology revealing flaws more readily. The stereoscopic technicalities were surprisingly flawed given the talent and experience behind it. Most scenes worked for the most part. Errors started showing up in some reflections (like braided jewelry in Fili’s beard) as well as shots in the prologue and epilogue where you have lots of bits of small shiny things. The stereo didn’t resolve properly – even at the high frame rate. Another stereo-flawed area (for no good reason), was in Rivendell, primarily in the scene where Gandalf is talking with Elrond, Galadriel, and Saruman. Problems also occurred when reading the Moonrunes near the waterfall. Water is notorious in stereo because of the either the reflection and refractions causing polarity issues, or the high amount of small particulate mist (like in this scene). The mist is a volume, which can become problematic in practical photography – but is usually resolved if the volume is CG (which this is). So, I’m not sure why there were problems. A similar issue presented itself in the Out of the Frying Pan, Into The Fire sequence, because of all of the pine needles and branches in the trees. Depending on if the branches were practical or CG, they would resolve better or worse. Shooting that kind of detail (pine needles) on a greenscreen is difficult to pull a matte from as it is. When you add another camera, it doesn’t double the work. It increases it exponentially. This is because the mattes have to be pulled in EXACTLY the same way in each eye for the audience to perceive the stereo. If one branch looks slightly different between the eyes, it causes an almost subliminal poking in your brain. Unfortunately, the visual effects were hit and miss – albeit with the lion’s share being hits. Given that every single cut in the film is a visual effects shot, with a total count of approximately 2100 cuts, the amount of work is astonishing, and credit must be given to everyone involved in the undertaking. The scale issues between Gandalf, the Dwarves, et al, where simply flawless. The mountain trolls definitely had their high points (and a few low points). I loved the Stone Giants. I wasn’t as much of a fan of the goblin sequence, or the Goblin King, really. I think I had issues with the design more than anything. But there were subtleties in the performance that I can appreciate. And Gollum is impeccable with newer motion capture technology from Avatar and Rise of the Planet of the Apes to capture Andy Serkis’ performance (I think he also did second unit direction for at least this sequence.) He also got a new skin shader, muscle system, and hair – way more sophisticated than back on Two Towers. However, there are some sequences here and there that are totally 1976 Freaky Friday level, the most glaring one being the Orcs chasing Radagast and his Rabbit-pulled sleigh. But, the Prologue with the town of Dale and the attack of Smaug, felt quite sub-par in relation to the rest. A few of the Rivendell matte paintings felt rushed. While Lord of the Rings did a substantial bit of sleight of hand between digital, practical, miniatures, and forced perspective gags, The Hobbit fell back on digital solutions more than anything. In stereo, you just can’t use some of the older tricks. But, the extent to which sets were digitally extended rather than built practically contributes to some less convincing shots. While working on The Two Towers, the Flooding of Isengard sequence was dropped on us artists about three months before the release of the film. It was a huge sequence with tons of artistic and technical challenges to overcome. I have a feeling that for The Hobbit, there were a number of things that were thrown in at the last-minute. If I were to wager a guess I would put into this category: The Prologue, Radagast, The Dwarf/Orc Battle, Death and Revival of Sebastian the Hedgehog, and the pale orc. Again, this is simply a guess as to why some of those shots were finalled way before they should have been. However, it doesn’t include the sequences in their entirely because there is some absolutely exceptional work in them as well. Thorin and Azog facing off amongst a burning forest in a series of closer and closer close-ups was phenomenal in relaying the thoughts behind the characters — one real, one CG. I don’t know why the rest failed. It remains a mystery. My personal feeling is that the high frame rate reduced the believability of the visual effects, rather than making them more immersive. Seemingly, this is a very subjective opinion. I have friends who feel the exact opposite. I left the movie feeling satisfied by the movie experience, but because of the film itself, and not because of the high frame rate and “enhanced immersion”. The next day, I went to another screening. IMAX Theater. 24 frames per second. Dolby3D. I couldn’t watch the first ten minutes with my glasses on. It hurt too much to watch. With my glasses off, however, my supervisor brain kicked in and I started analyzing. The divergence and convergence (the distance between the left and right eye) was off the charts. Convergence is where the two images come together – essentially, when objects are where the screen is. Divergence, positive or negative, is when the eyes separate, creating the illusion that the image goes into or comes out of the screen. Generally, when doing a stereo movie, the amount of divergence should not be wider than the distance between someone’s eyes. And half that if you intend to have things coming out into the audience. Plenty of directors break that guideline, which can contribute to more headaches and nausea. But those are the guidelines. Our eyeballs don’t face apart from one another – unless you’re Marty Feldman.. It’s not how stereo vision works. The solution to this problem is that you push the images closer together the bigger the screen is. I believe it’s called a depth grade. Just like a color grade, you can adjust the depth on a shot by shot basis (to a degree). However, most directors don’t have an IMAX screen to grade to. This seems to be a common problem when seeing 3D movies in IMAX. And The Hobbit is no different. To compound this, the convergence was swimming, meaning that the left and right eyes were constantly moving back and forth slightly. In some cases, it’s intentional, like when you are guiding the audience’s depth perception from a background object to a foreground object. You shift what is converging, which pushes the depth forward or back. However, at this theater, something was off with the projectors, I believe. The two images were almost shimmering against one another. And to add insult to injury, there was a piece of dust on one lens. So it appeared in one eye and not the other. So irritating. It looked like the way they achieved the 24fps, was to remove every other frame. A mathematically sound way to do things. However, when shooting at 48fps, you have a shorter exposure time for each frame, which means that you have less motion blur (one of the contributing factors to 48FPS looking odd). This makes fast motion look “smooth”. However, if you then remove every other frame, without somehow processing it to simulate a longer shutter time, then you get a stuttery motion. An extreme example (at 24fps) would be the opening scene from Saving Private Ryan, or the Tiger Coliseum Battle in Gladiator. In these cases, the director of photography decreases the shutter time (technically the shutter angle) that effectively reduces the amount of motion blur, giving very sharp images for each image, but the end effect is that it “stutters”. I have heard that for The Hobbit, Jackson and Lesnie decided on a 270 degree shutter angle to try to find a happy medium for the motion blur. A normal film camera shutter that we are used to seeing is 180 degrees (or half of the exposure time per frame). So, even at that increased exposure time, 24 fps would come out to be 135 degrees – low enough to be noticeable. This effect is not appealing in stereo. It hurts. And it’s the very reason I had to take my glasses off for a while. I finally put the glasses on and made it through my second screening. Many of the same stereo issues from the first screening were present in the second, only exacerbated by the larger screen. Finally, I watched it again, at home. Visual Effects Society screener. 2D. 24 frames per second. The best screening out of all of them. I wasn’t distracted by the high frame rate or stereo problems. My head didn’t hurt from size and issue stemming from the IMAX screen. The slightly lower shutter angle wasn’t as much of a problem in 2D (even though some scenes still had a bit of soap opera-y feel). I watched the film as a film rather than a technical study. And I enjoyed it even more. I can’t hope that the next two movies will be at 24 frames per second. It’s already in the can. Sure, they’ll do some reshoots and pickups. But they aren’t going to go back and change their methodologies. I can only try to grasp and enjoy the story despite the thick veil of technology.